5 dl (530 g) - 2 cups (1 lbs) 10% Greek or Turkish yogurt. Crush the biscuits in as small pieces as possible. It's easiest in a food processor. Otherwise, crush them by rolling them with a rolling pin. Mix the biscuit crumbs and the soft butter. Put them into a spring form and press them together as firmly as possible. Put the gelatin in plenty of cold water. Grate the lemon peel. Only the yellow part is needed. The white is bitter and should be avoided. Mix sugar, lemon zest, vanilla sugar and yogurt in a large bowl. You do not need to stir the out sugar grains completely. It's easier just to let it dissolve by itself, and just stir once in a while. 3 to 4 stirs is usually enough. Remove the gelatin from the water. Squeeze it with your hands so that as much water as possible is removed. Melt the gelatin in a double boiler or a saucepan at low temperature with the juice of half a lemon. Mix the gelatin into yogurt mixture. Put in the fridge for at least 2-4 hours. Until the mass is set. Again, put the gelatin in plenty of cold water to soak. Put the raspberries in the water from the recipe. Boil them for about twenty minutes. Sieve the fruit pulp through as a fine a sieve as possible. Optionally you can sieve the juice through some cheesecloth or a coffee filter. It looks nicer when the gel is completely clear. Add lemon juice, sugar and the soaked gelatin. Pour over the cheese filling. A good technique is to hold a spoon close to the filling and then pour into that, and then from there let it run down on the filling. This prevents the surface of the cheesecake getting swirled up and stirred into the gel. If you use a food processor, you do not need to melt the butter. Just cut it into smallish pieces, pour it into the biscuits and blend it together. The easiest way to create a water bath to melt the gelatin is to fill a bowl with hot tap water and then put a metal bowl with the gelatin on top of it. I like cheese cake with the jelly layer. It's beautiful, fun to eat and it tastes good. But if you want a cheesecake that is very easy, just put some strong jam or marmalade on. Otherwise serve with pickled fruits. Like Amarena cherries. If you decide to make gelatin topping and don't want to use raspberries. Other types of rich dark fruit can easily be used instead. What I mainly do differently in this recipe is to use the drained yogurt instead of cream cheese and/or sour cream. 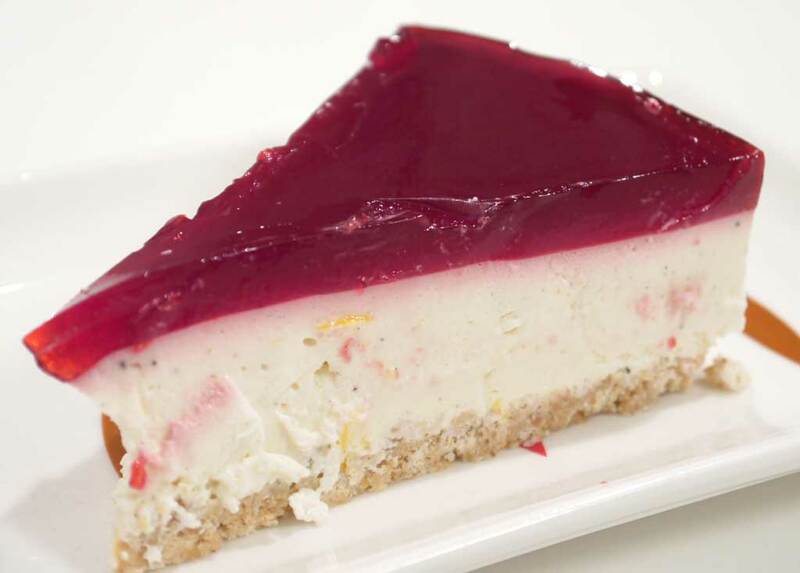 Most of the cheesecakes recipes that are circulating were made before drained Greek yogurt was common in Denmark. But 10% fat, drained yogurt has the perfect texture and acidity for this cake. 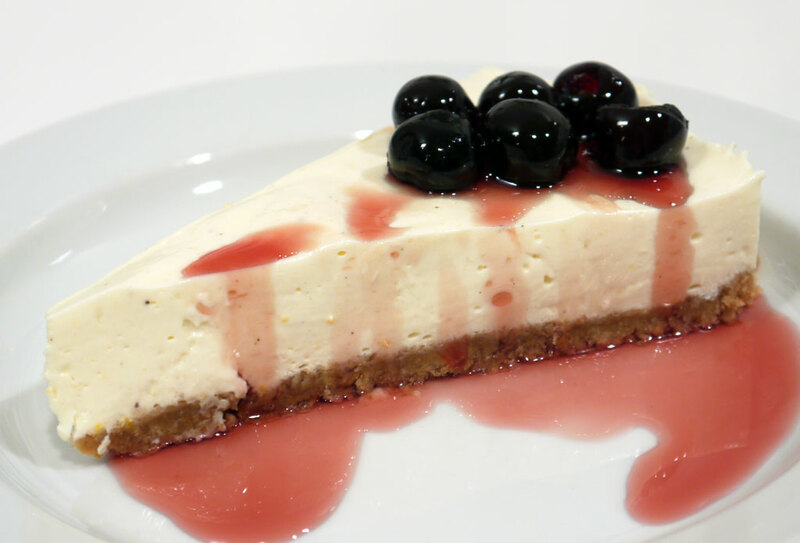 It is called cheesecake because it is usually made with cream cheese.